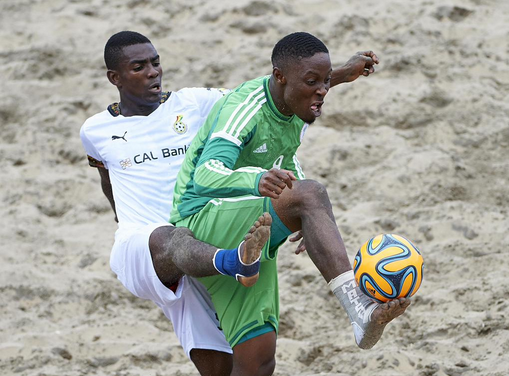 The stage is set for the second edition of the Africa Beach Soccer Cup of Nations to be hosted by Nigeria next week, after officials of the Confederation of African Football flew into Lagos on Thursday. CAF Secretariat staff will set up a desk inside the Eko Hotel and Suites on Friday, just as thenff.com learnt on Thursday that all participating teams are to take up their accommodation on Saturday. The delegations of Ghana, Egypt, Cote d’Ivoire, Madagascar, Libya, Senegal and Morocco will fly into Lagos on Saturday, as host team, Supersand Eagles, also make the short trip from their Aivoji Beach camp in Badagry to Victoria Island the same day. Meanwhile, the Ivorian beach soccer national team on Thursday traded tackles with their Moroccan counterparts in an international friendly by both countries ahead of the second edition of Africa Beach Soccer Cup of Nations starting in Lagos next week. Egypt, who have been in camp since August, participated in the Samsung Invitational Tournament in Dubai before flying to Lebanon, and will play the Lebanese team in a three –match series. Officials of Kinetic Sports, organizers of the COPA Lagos Invitational that is being reduced to a one-day show this year as a result of the Africa Beach Soccer Cup of Nations, confirmed to thenff.com that the Swiss contingent is expected in Nigeria on Friday. Enyimba FC of Aba will take on Pepsi Academy in a curtain raiser for the Nigeria/Switzerland match on Sunday, which kicks off at 4pm.